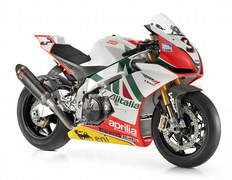 With the RSV4 Max Biaggi Replica the Aprilia Racing offers the sports enthusiast a motorcycle which is as close as you can get to the RSV4 that Max rides on the track in World Superbike. The Biaggi Replica is born to provide racing emotion even outside of the track. The bike develops 200 horses and weighs just 175 kg (386 lbs) in motion with an empty tank, and the fairing, seat, rear cowl and engine cowers are made of carbon fibre. Price: 50 000 euros.